A friend just bought a PowerMac G5 Dual Core 2.3 GHz. As a consequence he migrated his PowerMac G4 dual 1.25 GHz to his wife, who in turn gave me her ancient Power Mac G3/400 Blue & White "Yosemite," manufactured way back in 2000. I asked if she wanted a receipt, but she said that knowing she had donated to the "Garbell Home for Wayward Computers" was sufficient reward. For me it would be our sixth Mac, and a candidate for an extra Mac OS X 10.4 Tiger machine. But as shipped, this G3 lacked one necessity: a DVD drive. The Mac OS X 10.4 installer only comes on 4.7 GB DVD’s. So I removed the original Apple-Sony CD-ROM drive and replaced it with a $29.99 Mad Dog DVD-RW (MD-16XDVD9-8X, from Outpost.com - Fry's #4636838). 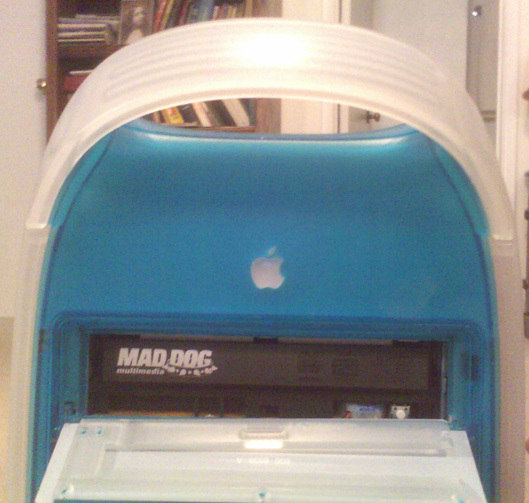 The Mad Dog DVD nestled inside the elderly Power Mac G3, providing new teeth for Tiger. The G3 was running Mac OS 8.6, and on reboot the old drivers recognized the new Mad Dog optical drive. I inserted the Tiger installer DVD and selected it in Startup Disk Control Panel. After restarting I held down the C-key to assure the Tiger DVD disc was chosen as bootable installer. I'd previously seen Tiger recognize these economy 10/100/1000 mbps network cards in G4's but was unsure if a G3 could handle it. A clear-cut confirmation came when Software Update eagerly presented me with seven patches, including the 10.4.6 update. Only with networking compatible with Apple's Web site could theses patches be defined, so the Mac OS X installer had acknowledged and configured the Ethernet card as a desired option. These Airlink101 AGIGA32PCI cards do not include a Mac driver, but Mac OS X seamlessly addresses their Realtek chipsets. (Outpost.com - Fry's #3887837; http://www.airlink101.com). As with the Mad Dog DVD manufacturer, I've now written the Airlink vendor and encouraged them to designate "Mac OS 8.6 to Mac OS X 10.4" as within their "System Requirements," even without any specially added “Mac” drivers. I intend to use this venerable Tiger G3 as a Tiger test box, and also as a personal file server to handle backups from my Power Mac G5 2.5 GHz dual processor, and from a couple of Windows PC's used by my family. Transferring data over our home's gigabit LAN is quite swift.